1) Only one of GX-02, GX-04, GX-06 or the standard RS-232C interface can be used. 2) GX-04 and GX-06 are factory-installed options. 3) Only one of GX-04K, GX-06K or the standard RS-232C interface can be used. The MC-10K/30K are not IP65 compliant with these options. 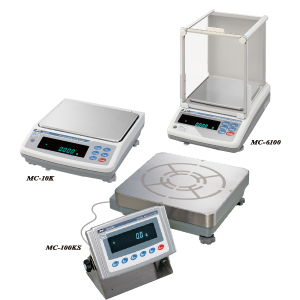 ** Repeatability when the auto-centering pan or an automatic loading machine is used under good ambient conditions or loading / unloading weight at the same position with an automatic loading machine. *** When automatic self-calibration is not used. **** When an auto-centering pan or an automatic loading machine is not used.